War, disease, scandal and death were to be visited on George and Fanny Muir from the mid-1850s onwards. Central to the 1850s was the Russian War, popularly known as the Crimean War, mostly fought in and around the Baltic and Black Seas between 1854 and 1856. 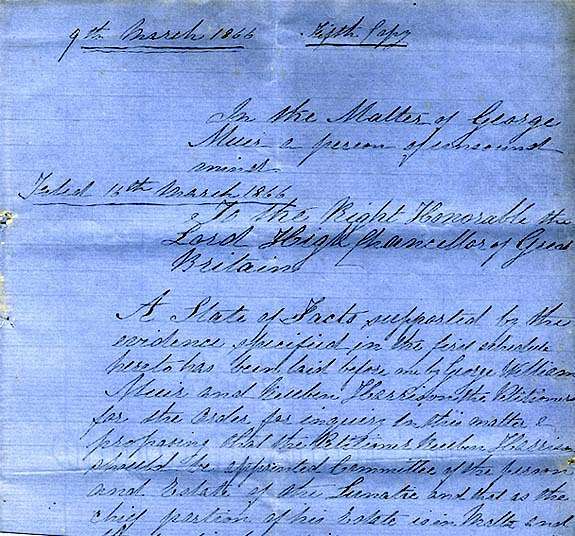 After education at the Malta Protestant College, oldest son George William Muir had joined the Civil branch of the Royal Navy. In July 1853, when he was fifteen and six months, he joined HMS Albion as an Assistant Clerk. He was to serve with distinction throughout the coming conflict. It is known, but not corroborated, that George Junior spent five thousand pounds - a small fortune in those days - on fitting out and equipping a ship with stores for the troops in the Crimea. It is not clear whether this was a grand gesture of patriotic philanthropy or simply a large punt on the chance of making a considerable profit out of the war. My money is on the latter more prosaic option, although it is possible that I do him a disservice. Nor is it clear whether he was in this enterprise on his own, or in partnership with others. What is clear is that all was lost. On the 14th of November 1854 there was the most ferocious storm, a hurricane, which battered the Crimea and played havoc with camps and supply lines. A number of vessels outside Balaklava Harbour were dashed against the cliffs and lost, including the smart new steam transport Prince (see right) laden with winter clothing and other equipment for the troops. Family mythology says that George Junior's ship was also among that number. Interestingly, there was a "privately owned Maltese brig" recorded among the losses as being destroyed with all hands. She is not named in the records, though one writer recorded her as possibly Il Malti. I feel certain that she was indeed George's ship, but we may never know for sure. 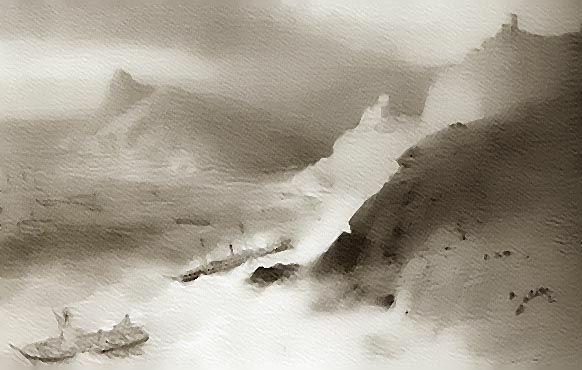 The Great Storm in the Black Sea on the 14th November 1854. Prince is dashed against the rocks outside Balaklava Harbour. (After Simpson RI). Click above to see larger image in a new browser. 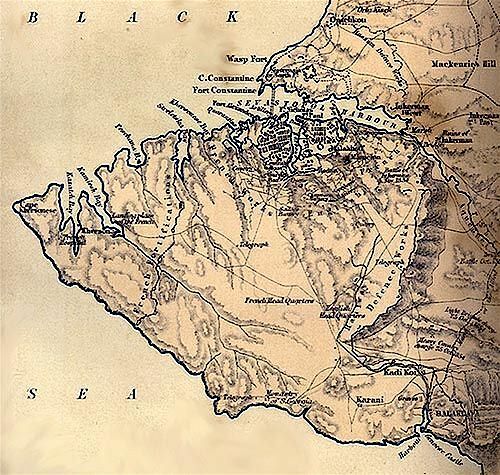 Contemporary map of the Balaklava Harbour area. The ships were wrecked against the cliffs to the right of the harbour entrance. To see a larger map showing Balaklava's position in the West of the Crimea, click on this map and it will open in a new browser. Sometime during the war Fanny Muir fell ill and returned to London, presumably in the hope of better treatment. It is not entirely clear, but it seems that her husband and two younger children remained in Malta. Her oldest son George William was at war in the Crimea of course. Among her many Way relations were some who lived in London and at least one doctor. However, it was cancer. She died on the 11th of December 1857 at 34 George Street, Hanover Square. 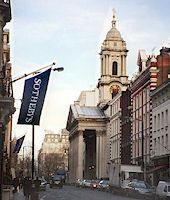 The death was registered at St. George Hanover Square, which was just around the corner. She was recorded as the wife of George Muir, Librarian. The cause of death was given as "Polypus of the uterus 2 years. Peritonitis 10 days. Certified." The informant was F.L. Laplume of Arnside Villas, St. John's Wood, Marylebone. It was a Victorian nicety that Syphilis was rarely referred to directly, despite its very widespread incidence throughout all levels of society. 'Nice' society just didn't talk about it. The disease was rife and George Jnr. was clearly a sufferer. He returned to England in August 1865 and was certified a lunatic. His death certificate three years later describes cause as General Paralysis (of the Insane). From the age of eleven, for the following sixteen years, he had been at sea in the Royal Navy. There can be no illusions about his probable lifestyle during this time and ignorance and irresponsibility concerning STDs came with the territory. It should also be remembered that this was pre-penicillin and the disease was still commonly treated with mercury. The fact that George was diagnosed in the mid-1860s with General Paralysis of the Insane suggests he had contracted the disease years before. The final stages of Syphilis, Tertiary Syphilis, can develop into Neurosyphilis which is characterized by softening of the brain tissues, causing progressive paralysis and insanity. So, certified a lunatic and placed in Manor House, a private asylum at Chiswick, London, founded by the Quaker Edward Francis Tuke (c1776-1846) and continued by the Tuke family. The Tukes originated in York and were well known for their study of lunacy. In the 1860s Manor House was run by Thomas Harrinton Tuke. The committees were the patient's oldest son George William and his half-brother Reuben Harrison the London coachbuilder. Reuben Harrison had power of attorney and hence control of his finances. His son George William had a career to pursue in the Navy and apparently had little to do with his care. 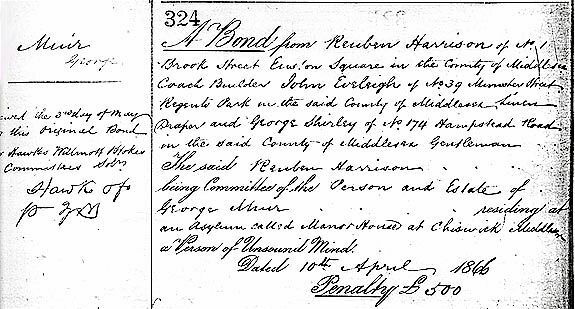 A bond with a penalty of £500 was signed by Harrison and two others: John Eveleigh who was almost certainly Harrison's father-in-law and John Shirley of London, gentleman. George Muir Junior died on the 4th of May 1868 and was taken for burial to Portsmouth, the place of his birth, on the 9th of May. He was buried in the Portsea Island General Cemetery (Mile End) in a vault "opposite No.23, North Side of Centre Path". In the 1970s, Portsmouth's International Ferry Port was expanded, engulfing the Portsea Island Cemetery. Before the expansion began, approximately 6000 bodies were transferred from Portsea to Portsmouth's Kingston Cemetery. However, records show that George's remains were not among them and presumably still lay beneath the ferry port car park. No trace of the cemetery remains. Incidently, it is unlikely that George William Muir was at his father's funeral. He was Paymaster in HMS Racer in the Mediterranean Fleet until paid off on the 17th of June that year. "In the matter of George Muir, a person of unsound mind..."
of the old cemetery in a new browser. 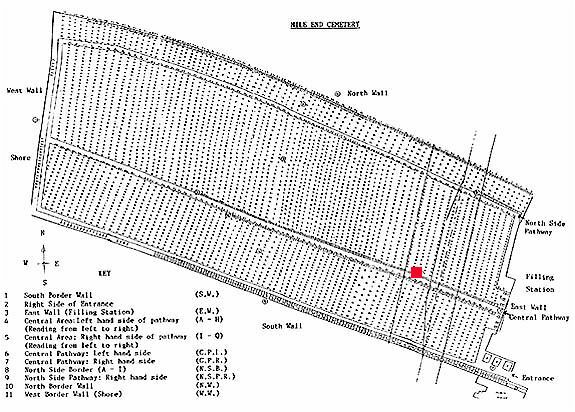 George Muir's grave is marked in red.